Bathroom tile removal. Ugh. Yes, it’s a huge task to undertake and one that’s very labor intensive. But, it’s not something which requires a ton of contracting experience. However, it does mean you will need a bit of a handyman’s skill set to get it right. In other words, if you are a total neophyte, and have some experience working with tools and some light to mid-level handyman experience, you’ll probably get through it just fine. Although, if this doesn’t describe you, it’s best to go with an experienced, licensed contractor. Now, before we get to the removal, let’s first deal with the disposal. Because, that’s going to be a big part of the whole remodeling process. In fact, it’s something too many people don’t even consider. That is, until the mess begins to pile up and it can’t be ignored. Then, you’ve got to get it out of the house so it’s not a tripping hazard or an obstacle any longer. Then, it hits you, there’s a big issue at-hand. So, do yourself a favor and plan ahead before you begin to gut the bathroom. After all, you put a lot of time and effort into what the finished product will ultimately look like. Give the remodeling debris cleanup some forethought. Schedule remodeling debris removal beforehand so it doesn’t become a huge mess. Use a 3-pound hand sledge and chisel. Start in a corner and begin chipping away. Do this with caution until you are confident what’s behind the tile. If you don’t, you risk creating more work by damaging the material underneath. Pry the tile away from the wall. Next, you can pry the tile off the wall. This will take a lot of time and effort to get it done, so be sure that you’re up to the task. Cut through the plywood with a reciprocating saw. 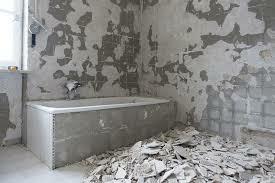 You might need to remove the construction material previously concealed by the tile. For example, if it’s plywood and it’s damaged, you’ll have to cut out the plywood and replace it. If you need help with remodeling debris disposal, go ahead and phone 800-433-1094 or visit Junk Garbage Removal.